Here at 08UK we offer great memorable 08, 03 or 09 numbers at great low prices. We provide memorable numbers for technical support, general customer service or new sales enquiry lines, obviously how/what you use the number is up to you. Everyone wants good numbers that are easy to remember to compliment new advertising campaigns. Sales Promotion numbers usually are 0800 or 0808 (free phone) these days or perhaps 0844 or 0843 (low call rate ) or 0845 (was local now national) or indeed 0870 (varied national rates). 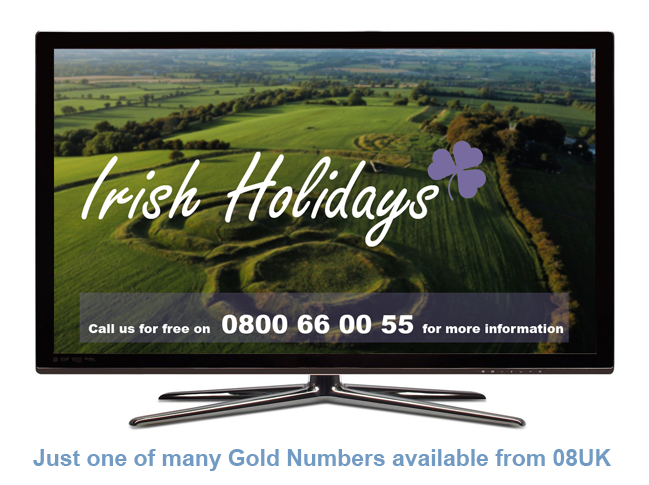 Great memorable numbers such as 0845 00 22 555 are available today. The 'blocking' of numbers (blocking is a memory technique) helps to make for easier recall double two double three treble four for instance. You could simply use consecutive or running numbers like 0845 123 4567 or alpha numeric options like '0844 DOG FOOD'. I am looking for a new memorable 0800 freephone number for my business…. we want a nice 0800 number that we can keep for life? Would you consider 0808 also instead of 0800? Gold 0800 numbers (as they are known) of that quality are rare now from major carriers and do carry a set up charge. It is cheaper and easier to get a memorable 0808. We can potential offer 0800 number as a six digit 0800 option – but they are very expensive to buy as they are virtually impossible to find. Platinum & Gold 0800 number are the best 080’s, they are seven digit 080 options – they cost up to 10K with the carriers direct. However we offer Gold 08/03 numbers from £250, up to several thousand for the best. Calls to these 08 or 03 mobile friendly numbers can be routed to any lines/numbers in the UK, landline or mobile or SIP or Skype. We can give your business the flexibility to distribute & best handle your calls according to callers needs or agent skill set or time of day. Callers responding to the advert find it easy to recall the number from the advert (that they have just seen on TV perhaps) if it has blocks or a synergy. Call Recording / Voicemail / Postcode Call Routing are all possible features we can apply to your inbound calls for better handling. Feature rich user friendly advanced web platforms allow for instant call routing & automatic-disaster ready planning to cover all possible scenarios ensuring business continuity. Perhaps a 0844 or 0845 (whilst not having to pay for 0845 or 0844 number service) may be perfect for you to promote/encourage the right balance of calls into your sales lines, a memorable 0330 would be even more favourably received as a customer support line then callers from mobiles or landlines all only pay a low local call rate (or call is included in bundle packages - to same affect). New rules applied in July 2014 means that customer support or after sales support must be offered on an 01,02,03 or 0800 number to remain compliment with trading standards rules. National 09 numbers that are memorable (easy to remember) & are used by businesses who want to gain a revenue rebate monthly to pay towards staffing services, perhaps to cover the cost of staffing the service itself. Note you can earn a revenue (with no charges to pay what-so-ever) from 23ppm up to 65ppm for all 09 minutes of calls from a memorable 0990 or 0996 number. If you are interested in using a 09 today, you must register and get permission from the Phone-Paid Services Authority first. Or pick a new 13p/minute 0871 number range where rebates start at 3.75p/minute, with no charges, so no set up or rentals per number. Web portal access is standard so zero charges apply plus our operations tram are provided as a free supporting resource to all our clients during normal office hours.